Candidates for the Democratic Party's nomination for president, Bernie Sanders and Hillary Clinton, have both promised that if elected, they would put forth legislation that would dramatically reduce tuition and student debt for public universities in one form or another. This opportunity is a lie in itself. In order for the federal government to pay for all these students, it would be necessary for more tax money to get funneled to students who hold no real obligation to complete their degrees, and a lot of students who should not have gone to college in the first place would get degrees they don't know what to ultimately do with. "Once again, the administration is pursuing initiatives to subsidize rising costs, instead of working with Congress on policies that actually would address the driver of college cost increases: the open spigot of federal student aid. Over the past several decades, college costs have risen at more than twice the rate of inflation, thanks in large part to federal subsidies." By sending more grants and subsidizing higher education even more, that bad habit only creates the incentive for schools to drive up the costs, the ultimate reason behind soaring tuition rates. Because of this effect, every year students take out thousands of dollars in student loans to cover the cost of an education they can't afford, in order to get a degree for a job that doesn't exist or isn't available, leaving them with debt and unemployment. This betrayal of the American people takes away from ways people can still invest in themselves without being slaves to debts owned by the banks. The idea behind free community college alone isn't about greater access to education. In today’s world, information is everywhere thanks to greater access to technologies and the internet, bridging the gaps between social mobility and economic opportunity greater than any point in human history. Looking at great sources like a local library or even the online Khan Academy alone shows just several ways people can access knowledge on their own accord. These resources are free and readily available to the entire public, the only thing that free community college would do is grow faux credentials by inflating the number of degree holders and promote more obtrusive, more burdensome, federal regulation. "Allow markets in higher education to work by limiting federal subsidies instead of increasing them, and costs will fall for students attending colleges of all types." "It makes no sense to me that when we need nurses, we need doctors, we need dentists, we need more people involved in healthcare, that when people leave school, for the crime of wanting to be involved in healthcare, they have enormous debts. That makes no sense... I will fight to implement as president, that will make every public college and university in America tuition-free." "... The analysis finds that exchange plan networks include 42 percent fewer oncology and cardiology specialists; 32 percent fewer mental health and primary care providers; and 24 percent fewer hospitals. Importantly, care provided by out-of-network providers does not count toward the out-of-pocket limits put in place by the ACA." "...Throughout his presidency, Obama has labored under the delusion that a liberal arts education is the best thing for absolutely everybody. But we are living in a time when trade and vocational schools are becoming extremely important, as are technical colleges, and the good old-fashioned work experience that led dropouts like Bill Gates to become great entrepreneurs." This should be common sense, someone with a degree in 18th century French basket weaving studies (I made that degree up, but would it surprise you if it existed ?) is gonna have a hard time getting a career started since there is literally no market for someone who is an expert in 18th century French basket weaving studies. The reason why I choose this metaphor is because most of America's students fail to understand that some degrees just have a terrible return on investment in the long run. Unless Clinton and Sanders start controlling the economy directly and can manipulate supply and demand, that scenario would also have to force them to limit what people learn and what degrees they have to choose from. That's the fault that progressives ignore, risk! When little Johnny Graduate graduates from high school and decides to major in 18th century French basket weaving studies, that is the risk he is taking,his money, his time, and ultimately his life choices; Johnny Graduate alone is responsible for himself and has to deal with the results of his decisions without dragging down other people with him, or using government to fulfill his entitlements through force and coercion. The federal government subsidizes this bad behavior already by giving schools who want a profit, and students who want a degree, a financial steroid which creates falsified hope and pushes the real issue down the road. Bernie Sanders specifically should not be taken seriously at all (not that I am suggesting Clinton is any more economically literate), since it should be a red flag that anyone would be advocating for socialism in America while socialist Europe is literally falling apart. Is $33 dollars a year per person in taxes OK for everyone to have free college? That was Obama's old plan. @Freedmfiter The war in Iraq is $815 per person. Is that okay? NO it is NOT ok. We need to be responsible for ourselves. The federal government has an insatiable appetite for spending taxpayer money on bleeding heart projects, yes FREE education is a bleeding heart project - we just have to help this group or the other - and once they do, they congratulate themselves for looking out for the needy - it' so damn easy to give away my money, makes me sick. Only $33 here and $50 there $100 somewhere else. It will never stop! I have recently received an invitation to take part in a conference phone call from the White House concerning what college students can do to push this free community college agenda. It says it is off the record and that the president will be talking about it in his state of the union address. I am currently a community college student and This invitation was sent to me through the honors society which I belong too. The White House is going after the student leaders. It is my intention to attend this phone call and record it. I will be posting it on every medium I can find. If we know the strategy we can defeat it. The phone call will be taking place on Sept. 2nd. Shane G., let me get this right...you actually think that a person 'pretending' to have the answer to a problem then the one who does not have one? Really? It never occurred to you that the one that tells you flat out, 'I don't have all the answers' is being honest, and the other is a liar, and you would rather vote for the liar? 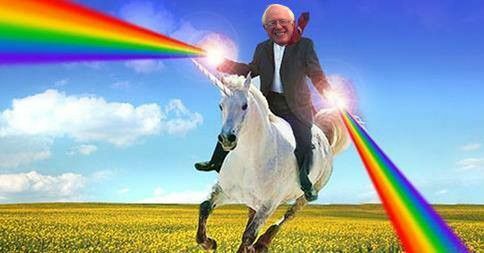 You can go on and on about how wrong Bernie Sanders is, but until Republicans give an alternative solution where I still have a chance at a successful life, Bernie has my vote. As a millennial who is starting college in a year - there is nothing scarier then the thought of being trapped in an endless debt just so I can have a job where I make more then $8 an hour. I know that my family cannot afford college, I also know that by taking a student loan you are screwing yourself and the rest of your life. Stop focusing on proving others wrong, because quite frankly, we don't care. Instead, start focusing on coming up with the right answer, because right now all you are doing is showing us that you don't know what to do about it, and if Bernie is at least pretending to know what to do, then he is the better candidate. PS: The title of this post is stupid. Many countries have free education. Just because it doesn't exist here, doesn't mean it doesn't exist - look at Germany, Sweden, France, and many more. These countries also have 50+% income taxes. Would you approve of that? The best alternative solution that gives you a chance at a successful life involves getting government out of the way, not getting them more involved. I imagine if you did a small amount of research, you'd find plenty of ideas specific to lowering the actual cost of education (vs. just shifting it from students to taxpayers). You might even find some ideas that are supported by Republican politicians (though more likely if they lean Libertarian). Bottom line, we have a much greater problem having jobs (specifically, private-sector jobs) for the college-educated kids who are graduating than we do educating kids. Regardless of your feelings about shifting the cost of education from students to taxpayers, I think it's safe to say nothing about the "free education" idea helps create more jobs--that would just create more college-educated kids who still have a terrible time finding a job. Excuse me ShaneG, but just who do you think is going to pay for your free education; the tooth fairy? I can appreciate that the future looks frightening from where you stand. Unfortunately, Bernie isn't leveling with you about "free college" -- he just promising you something you desperately want in order to buy your vote. The truth is that there is no education in any country that is "free". The students themselves, may not be required to pay the tuition, but somebody has to pay it -- those college professors won't work without a paycheck. The problem is that the government does not have any money of it's own to give to anyone. The government cannot 'give' to anyone what it does not first 'take away' from someone else -- they use taxpayer money for everything. That's how every "free" thing is paid for. If government wants to make college free, then stop paying the Professors and Administrators. They could then apply for a welfare check. "a lot of students who should not have gone to college in the first place would get degrees they don't know what to ultimately do with" That's true, if someone gets an art degree they probably won't find an art job, but hopefully their core curriculum will educate them enough to not vote conservative/republican/libertarian. Please don't compare Libertarians to the mental retardation that is Republicans and Conservatives, thank you. Essentially you are admitting to the fact that colleges have become little more than Indoctrination Centers for Left wing thinking. Junior did you not understand the article? Perhaps you are the one with an art degree and no job. Keeping voting for tge liberal,progressive,democratic solcialists and the debt and unemployment will be worse. Aren’t Democrats Supposed to Hate Monopolies? Democrats have long railed against monopolistic practices in the market place. Indeed the bedrock of the early progressive movement was busting up monopolies and taking big businesses to court. Few political movements have done battle with well-established business interests as effectively as the early progressives. Last month, Rep. Phil Roe (R-Tenn.) introduced H.R. 2723, the Employee Rights Act (ERA). Perhaps the largest labor law reform in the US since the Taft-Hartley Act of 1947, the legislation would significantly increase work privacy, promote dialogue between workers and bosses, protect freedom of conscience, and expand legal rights protections. Having garnered support from Heritage Action and Americans for Prosperity, this vital legislation is a crucial step for worker freedom. Here are some thoughts from our friend, Dr. Arthur Laffer, on how economic concerns will factor into Americans' minds over the next several months. The brief can be downloaded here.